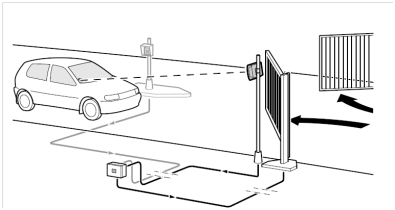 The PassMan software is suited for a RFID Reader (TagMaster LR and XT series) which is being integrated with an existing access control system using Wiegand or Mag-stripe communication protocols or for a Reader connected to a host computer and used in an identification system. The Reader communicates with an access control system or a host computer via standard communication interfaces. The main function of the PassMan software is to detect an ID-tag and automatically forward ID-tag data to the access control system or to the host computer. The Reader installed with PassMan has only limited decision-making capabilities on its own. The Reader application software cannot store any information about read ID-tags. Functionality is primarily placed in the access control system or the host computer. A typical application for an LR-series Reader installed with PassMan is an extension of an existing access control system lacking long-range reading range capabilities, for instance in an industrial area protected by a gate. The ID-tag mounted in the windshield is detected when the vehicle approaches the Reader. The ID-tag data is transmitted to the existing access control system that sends an opening signal to the gate if the reported ID-tag is to be granted access. The Reader is also capable of detecting moving objects without ID-tags.